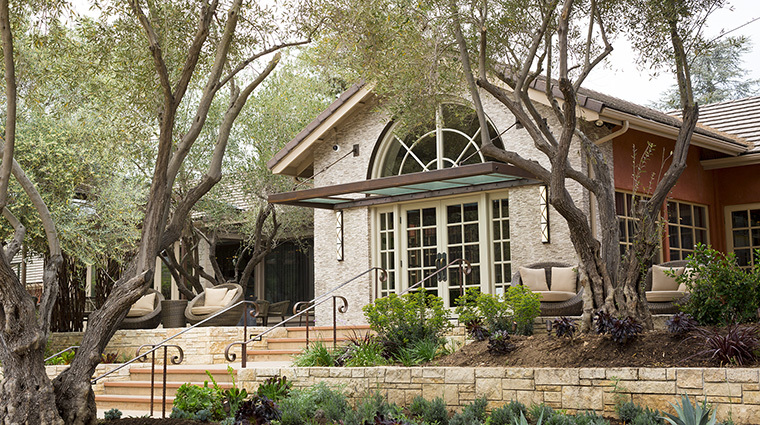 The spa offers an indoor-outdoor experience with a body-temperature soaking pool and treatments infused with wine grapes and lavender, which are grown on the property. In the center of the resort, you’ll find a pool, Jacuzzi and compact gym with new Precor workout machines. The destination restaurant Lucia, named after the nearby mountain range, is a sleek space with a full cocktail bar, a café overlooking the garden and an intimate dining room where you can enjoy acclaimed chef Cal Stamenov’s seasonal California-Mediterranean fare paired with the finest wines. 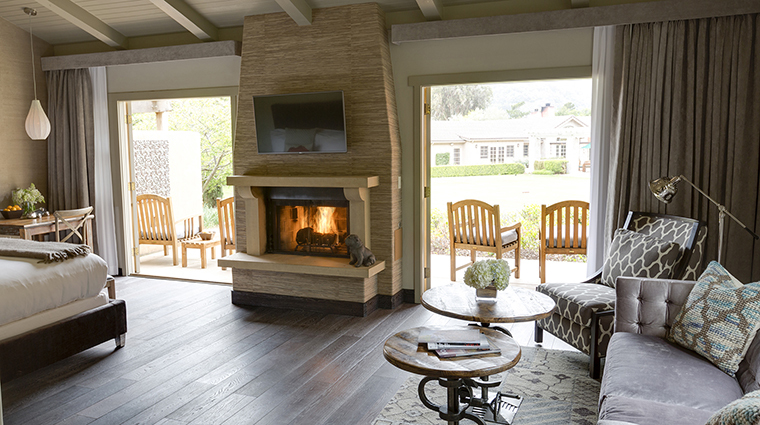 Nestled in the Santa Lucia Mountains, Bernardus Lodge is perfectly situated whether you want to drive to Big Sur for a hike, go play a round of golf in Pebble Beach or hit the sand in the summertime. Everywhere you look at the Bernardus Lodge, there’s a detail that exudes opulence and elegance. From the oversized velvet ottomans and vivid fresh floral displays in the lobby to the interplay of patterns and colors in the guest rooms, every detail is spot-on. 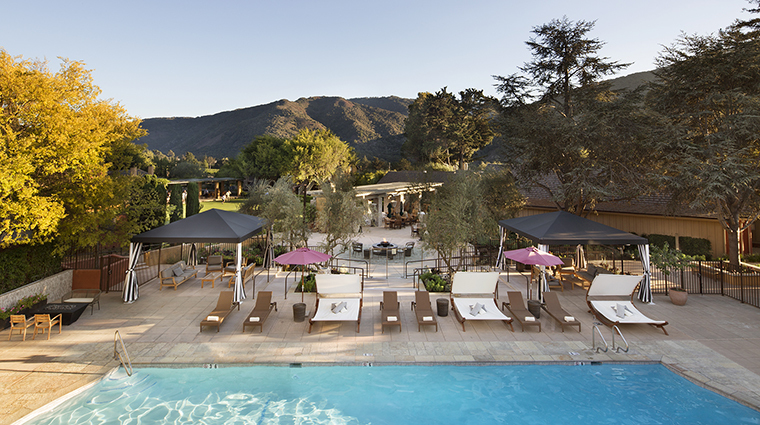 Whether you’re looking out at the bocce lawn, a courtyard with a fountain and blooming roses and jasmine, or luxuriating in the warming pool at the spa, there’s something pretty every where you look at this luxury hotel set in the Santa Lucia Mountains. The Spa at Bernardus is a spacious and restful place with lots of restorative therapies, as well as a full salon for men and women. Even before your treatment, you’ll start feeling relaxed as soon as you step into the warming room or take a dip in the 100-degree warming pool. Everyone is kind and welcoming at Bernardus Lodge, from the valet to the host who greets you to the maid who does the turndown service. And since there are only 57 rooms here, don’t be surprised if everyone greets you by name. Lodge owner Ben Pon didn’t like the idea of charging guests for a sip of water, so they stock the room with refreshments. You’ll find a carafe of purified water, two kinds of wine, soft drinks and snacks like fruit, goat cheese, brownies and potato chips in your room, as well as morning coffee and tea. Pon also runs Bernardus Winery, which is why those wines are featured in the guest rooms and the two restaurants Wickets Bistro and Marinus. 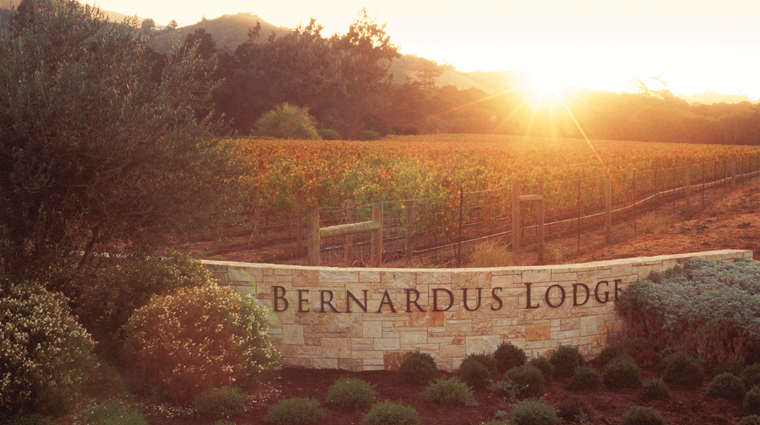 The concierge or the valets can direct you to the Bernardus Winery tasting room just a few miles down Carmel Valley Road. The Carmel Valley is a bit remote, so you’ll need either a private car or limousine to get to the Bernardus Lodge and to explore the attractions in the area. Even though nearby Carmel is known for its beautiful beaches, the weather here is often quite chilly. You can still have a California dream, but it’s a good idea to bring a warm sweater and jacket. Retreats unto themselves, guest rooms at the luxury hotel are well thought-out and warmly inviting. During the recent renovation, each of the 57 rooms was updated from the floor to the furnishings. Shimmering pale gray velvet sofas anchor the eclectic décor that mixes tribal dhurries and arabesque-patterned slipper chairs with softly industrial occasional tables and lamps. Beds feature diamond-pattern charcoal velvet headboards, Fili d’Oro damask stripe sheets and cozy mohair throws. In-room technology includes 42-inch flat-screen TVs hung over Italian limestone fireplaces and a Beats pill speaker. A generous assortment of nibbles and drinks, including two Bernardus Winery selections, is tucked away in modern sideboards with a gleaming lacquer-like top. But the showstoppers are the bath suites — the Carrara marble basket-weave floors have radiant heat, central soaking tubs are roomy enough for two, and large rain showers are stocked with locally made toiletries. 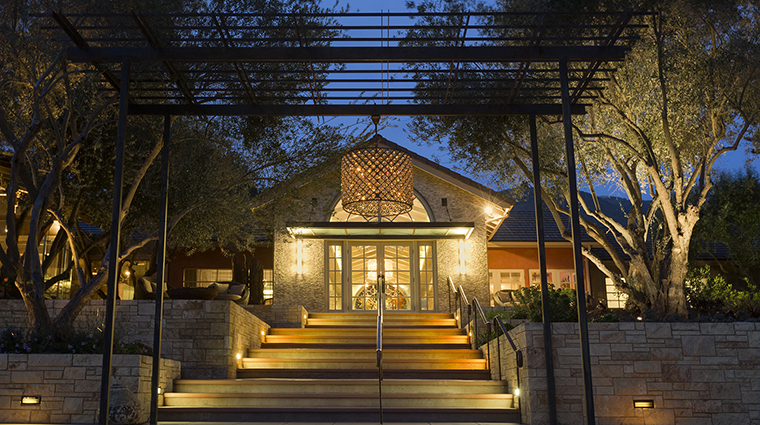 The crystal drum chandelier hanging from the arched entry signals the new ranch rustic-chic vibe at the Carmel Valley hotel. 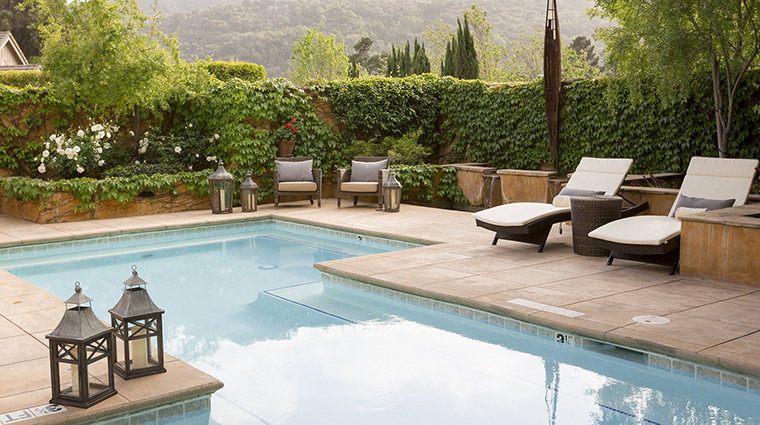 The curvy woven patio furniture on the porch and the expansive glassed-in patio filled with dramatic water features and fire troughs make Bernardus feel like a boutique hotel that just happens to be nestled in a valley tucked into the Santa Lucia Mountains. Indoors, textures like grass cloth, split face limestone, and weathered French oak floors along with leather seating and burnished metal pieces give the lobby and Lucia restaurant a luxe, natural atmosphere — ideal for lingering by the fire with a glass of complimentary sauvignon blanc.